Welcome to the best page on the internet. Here you will find every chocolate deal found by our community of deal hunters. The best chocolate prices from Hotel Chocolat, Thorntons and all supermarkets. Whether you're looking for luxury champagne truffles, a chocolate gift set, or a Terry's Chocolate Orange... you'll find it all here. Plus, chocolate flavoured protein shakes, fondu sets and other goodies. Remember to try looking for a voucher code to stack on top. It's a great way to save an extra few pennies... to spend on more chocolate. 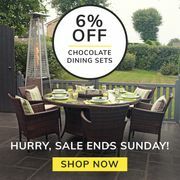 6% off Chocolate Mix Dining Sets! If you want to satisfy your sweet tooth for less, the best time in a year to buy cheap chocolate online is every November, January and February. In the weeks leading up to the holidays, one of the greatest selling points of chocolates are their special holiday packaging. However, it is not much on one after the holidays have come and gone. If you don’t mind getting chocolates with off-season packaging, you can get cheap chocolate boxes and cheap chocolate bars online for 75-90% off after any holiday. This include Easter, Christmas, Halloween and Valentine’s Day. Christmas chocolate sale is almost immediate at numerous stores. If you browse through your favourite online shops the day or a few days after Christmas or any holiday, you will find all of their leftover chocolates on sale. But of course, any savvy shopper know the same trick, so the cheap chocolate deals from the likes of Tesco, Thorntons, Hotel Chocolat, Asda, Amazon and Marks & Spencer quickly dwindle. So make sure to shop early for the cheapest chocolate online deals on chocolates that you will actually want to devour. Fortunately, here at Latest Deals you will find great deals on chocolates the whole year round. Our money-saving experts and team of bargain hunters are always sniffing out cheap chocolate Tesco deals, Thorntons chocolate online promos, Lindt chocolate offers, Cadbury discount codes and voucher codes from all your favourite chocolate brands like Godiva, Maltesers, Galaxy, Hersheys and more! Whether you’re looking for chocolate clearance sale, cheap chocolate box for a special someone or cheap chocolate bars in bulk to stock, we’ve got you covered to ensure you will get the sugar rush you are looking for. A word of advice though once you see a fantastic deal you are interested in make sure to get it as soon as you can since they are limited. But make sure to keep on checking back since our bargain hunters post daily price drops and bargain steals to ensure you’ll only get the freshest savings around. You can purchase for someone who lives far away. You just simply select the best chocolate gift and have it delivered to that special person. You don’t have to leave the house, especially if the weather is not that cooperative and you have a schedule that does not give you the luxury of heading to a physical store. It’s easy and simple. All you have to do is click add to bag, enter your billing details and destination address. Unsweetened. This type is also known as baking chocolate, bitter chocolate, pure chocolate or chocolate liquor exclusively used almost for baking. Bittersweet. A European brand that’s also known as dark chocolate, this type of chocolate are typically darker and less sweet than the semisweet type and can be used for both eating and baking. Semisweet. This is probably the most versatile chocolate and is available in different forms like chips, discs, blocks and squares and can be eaten or used for baking. Milk chocolate. Most milk chocolates comprise less pure chocolate compared to bittersweet or semisweet chocolates but with a milder flavor than darker chocolates. Sweet baking chocolate. Sweeter than the semisweet type. White chocolate. This chocolate is made from combined sugar, cocoa butter, flavouring like vanilla and milk solids. It is commonly called a chocolate but it is not a true one thought. Premelted chocolate. Exclusively for baking, this chocolate is an unsweetened semiliquid product made from vegetable oil and cocoa powder. Glossy shine. This will indicate that the chocolate has been stored properly at about 65 degrees Fahrenheit. Texture. When it comes to talking about food in your mouth, texture is referred to as mouth feel. A quality chocolate should feel smooth and not grainy nor waxy. It should also literally melt in your mouth. Taste. This is what will determine which chocolate is perfect for you. Every chocolate manufacturer creates chocolate differently and is based on several factors combined such as where the cacao used came from, how they are roasted as well as the balance of sugar, pure chocolate and cocoa butter. Store your chocolates in a container that’s tightly covered or in a sealed plastic bag. Since chocolate is porous in nature, it will pick up flavours from other food items in your refrigerator. Ideal temperature is about 65 degrees Fahrenheit. Ideal humidity should not exceed 50%. Stored as stated above and you can keep it for one year. White chocolate should be stored in the freezer or ref. Keep in mind that condensation is the enemy of chocolates and your chocolate may get a so-called sugar bloom wherein dull spots are formed if you will go straight from your freezer to the counter. You can eat it but it may not be the same. Gourmet chocolates is best at room temperature and not advisable to chill or freeze. Let cold chocolate to slowly come to room temperature. Make sure to wrap it in a clean towel after taking it out of your fridge and you’ll see a huge difference. The primary ingredient listed of high-quality chocolates should be cocoa or cocoa butter. Percentage of cocoa should be at least 60%. It should come in a dark and well-sealed wrapper. A chocolate protected from moisture and light will have a longer shelf life. Chocolate should have a uniform colour. Look for matte gloss finish and avoid those with discoloration as this means that it has not been properly stored. You can keep dark chocolate for more than a year, both milk and white chocolates should not be stored for more than six months. So make sure to check the best-by date or if buying online, you can ask the customer support of the online shop. If a chocolate has a bit of sour aroma, disregard it.